In1902 Cadillac came out in Detroit, the auto city of the United States. Cadillac has created innumerable first and produced many luxury cars in auto industry over the years; In other words, Cadillac represents the luxury car history in the United States. The sign of Cadillac is famous corolla escutcheons, which is the symbol of the leadership in the automobile industry. The meaning of this delicate sign is the royalty symbol of Cadillac family. It also shows the courage and honor of founders in Detroit. 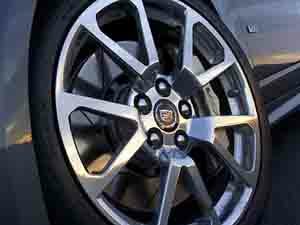 The design of Cadillac wheel rim is the front brake. Then the ventilated disc brake is followed. This style conforms to the habits of consumers. The foot brake gives us the feeling of pleasure. Wuxi Hengsheng Wheel Co., Ltd is a professional Cadillac wheel rim manufacturer and supplier in China. In addition to Cadillac wheel rim, we also provide other famous models steel wheels (rims) for our clients around the world, like Mitsubishi wheel, NISSAN wheel, OLDSMOBILE wheel, PONTIAC wheel, SAAB wheel, Saturn wheel, Scion wheels, Subaru wheel, Suzuki wheel, Toyota wheel, Mini wheel rim, Volvo wheel, etc. We possess a professional technology team to guarantee the manufacturing of Cadillac wheel rim. We will checkout all the products and give out a survey report. According to the needs of every client, there will be a dynamic balance sample survey among parts of the qualified Cadillac wheel rim. Chevrolet Wheel RimWilliam Durant, the founder of General Motors (GM), invited renowned Swiss racer and engineer Louis Chevrolet to design a kind of general application car-CHEVROLET in 1909.